Art is not entirely beautiful. Its ability to shape transcendent experience into material reality is often attached to aesthetic pleasure or “meaning,” but that isn’t to say such an angle requires consonance. Indeed, a large swath of art relies on confrontation, bewilderment and the ability to undermine. The music that we call jazz, improvised or creative music is often unsettling – it overturns notions of resolution, leaving musical situations delightfully unfinished, garishly dissonant, or saccharinely maudlin, and upending our emotional comfort zones with every rehearing of a given work. From Louis Armstrong to Charlie Parker, Albert Ayler and Peter Brötzmann, the music’s representation is full of such confounding moments. 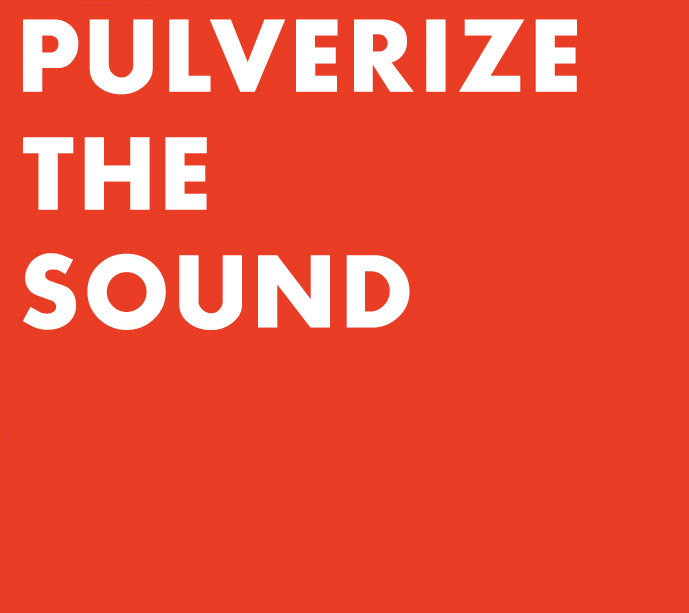 New York trio Pulverize the Sound is the latest to natter at the comfort zones of even dyed-in-the-wool ‘free music’ heads, and joins trumpeter Peter Evans with electric bassist Tim Dahl and drummer Mike Pride for a multi-part choreography of dayglo volleys. The music of Pulverize the Sound is closer to the crushing, voluminous shifts and buzzing harmonics of brutal prog – a conflagration of highly dissonant noise and metal signifiers within structures that are either didactically minimal or an archly-blistered whorl of time and dynamics. Dahl, whose distorted filters and workmanlike precision are the crisp sludge that engines this group, is a veteran of such rugged ensembles as Child Abuse, Lydia Lunch’s Retrovirus, and the improvised theatrical storm of BarrSheaDahl (with drummer Kevin Shea and guitarist Mick Barr). Pride has worked a pedigree that bridges jazz, improvisation and avant-garde rock, while Evans might be the closest the trio has to a “straight man,” given his clarion chops and a crackling, circular energy that transcends Real Book snatches with electro-acoustic blur. Not that these three musicians need to prove a certain pedigree to do what they do – the fact of their ability to weave snapping, breathy conversation, terse muttering and occasional bouts of crisply-sashaying swing into gleams of serrated rigor should be enough to spark interest. There are moments of wry, absurdist energy a la Brötzmann or earlier John Zorn, but one has to relax one’s guard a bit to accept that obsessive juggernauts, boneheaded pummeling and doldrums-like pauses act to create an uncommon group drama, not merely rattle. While not particularly easy to capture on record – live settings have been gleefully frustrating – it’s possible to gain an idea of what damage Evans, Dahl and Pride are up to from these six compositions, and that Pulverize the Sound are part of this music’s agitating continuum.